COMMENTARY ON "The Priority of the Promise"
I only bring this up because the author does. He points out that the promise was given to Abraham and the Law to Moses. I am aware that in SDA theology you have a distinction between moral law and the laws that only prefigured Christ. But let’s take a moment and point out we see no examples of the Sabbath at all with Abraham, or any other man in Genesis. We only see the Sabbath being kept by God in Genesis 2, that’s it. Which is interesting as there would be logical places where the Sabbath should have been an issue in Genesis if it were one. For example, Joseph knew that it was a sin to commit adultery and was willing to go to jail for not committing it. But he didn’t seem to have a problem with the Egyptian ten day work week. That never comes up at all. We do not believe that the Noahic Covenant abrogates the Adamic one where Christ is promised to crush the head of the snake (Gen 3:15). We do not believe that the Abrahamic Covenant means God may now flood the world at any moment. The premise in todays lesson is flawed in it’s reasoning and Biblical support, therefore I call into question any and all conclusions the author derives from them. The author seems to wish to pit law and gospel against each other rather than accept both as true at the same time. A mark of good theology means making fair distinctions in terms and usage. I’ll use the same verses that the writer does to make my point. The problem with the authors these is he assumes that Paul means the same usage of the law in both of these verse. In Galatians he is speaking of using the law in a justification sense, in which case it is fulfilled by Christ and not us in any fashion. Just because Christ does make the law of no effect to the believer doesn’t mean it is of no use to us in other senses. We can still use it as a guide for Godly living, we can still use it to evangelize the lost so they know their standing before a Holy God without Christ. It is however of no use to us for earning salvation whatsoever. This is why we needed Jesus to do it for us, and then deliver that to us in his blood. The writer seems to assume that SDA theology concerning moral and ceremonial distinctions in the law was something Paul was addressing in Galatians. It would be more fair to say that Paul is referring to what he calls the law of the Jews or “those under the law” (1 Cor 9:20). Jews today simply call this the “Torah”. There is no ceremonial / moral distinction innate to the Torah. Jews do not interact with it in that fashion. When theologians go in afterward in the full light of the gospel we can technically classify laws in the Torah as being moral or ceremonial in a ministerial sense, but one shouldn’t turn it into a paradigm that they interpret the rest of scripture with. How does someone do this? How do you tell which laws in the old covenant are moral and which simply prefigured Christ? There are only two objective ways of doing it. If it is clear in the text that God held pagan nations accountable for breaking a law in addition to the Jews who broke it, then it’s a moral law. If an apostle prescriptively commands Christians to keep a law after the resurrection of Christ then it’s a moral law. For example, pagan nations in the Old Testament are frequently judged for idolatry and sexual immorality. God sometimes sends the Israelites to carry out his judgement on pagan nations nearby for their sins in this regard. Sometimes God even sends fire straight from heaven and carries it out himself. It would be fair to say that these are laws that all times and all peoples are held accountable to and judged by. We don’t see surrounding nations judged by God for not keeping the Sabbath for example, clearly they didn’t, but this is never a cause for God’s wrath. Although, he does execute it on Israelites who break the Sabbath. See the difference? This is a law that only applied to a specific people for a specific purpose, in this case to prefigure Christ. If you want to you can even categorize these with the Ten Commandments to make them easy to memorize. It’s important to note that nowhere do the Apostles command that the Sabbath be kept by New Testament Christians. So by both counts we know that the Sabbath isn’t a moral law. Added to this are many verses that specifically abrogate Sabbath keeping (Col 2:16-17)(Rom 14:5). Anyone who has been SDA knows the mental gymnastics they have to perform to dance around those two verses, I don’t even need to paste them. If you’re reading this lesson you know them by heart anyways. Let me give the reader this challenge, try reading them without the gymnastics. Try just taking them in and believing what they say at face value. Know that Jesus died for you, and you don’t need to keep the Sabbath to be saved. Even in the end times. You are saved by Jesus and sealed by the Holy Spirit, not the Sabbath. And you are free to go to any Christian church, even one that meets on Sunday. Just go somewhere that the gospel is preached from the pulpit every week. That’s what matters. I will agree with the author in that those who bend Galatians towards antinomianism err greatly. 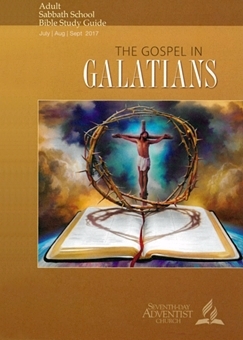 The author does this apart from the point of Galatians though and this is the real problem. Paul is rebuking a false gospel of salvation by old covenant law keeping. Specifically, someone in the congregation was teaching people that they had to be circumcised to be saved. Circumcision was a sign of the old covenant that prefigured Christ. By telling New Covenant Christians that they needed to do this to be saved, this person is in effect telling people that they need to look forward to a new messiah that has not yet come to be saved. This is a false gospel because it is a false Christ. This is not all that different from SDA today who teach that you need to keep an old covenant seal to be saved, the Sabbath. The Sabbath prefigured the coming of the messiah (Col 2:16-17). By teaching people that you need to keep the Sabbath to be sealed in the end times you are confessing with your actions that Christ has not come yet and we still need to look forward to a new messiah. Like the Galatian heresy this is a false gospel because it is a false Christ. I can understand that this would be a very challenging direction for the author of this lesson to go in. He is after all writing this lesson to Adventists who would be reading it in Sabbath school. But I say shame on him anyways because it’s actually the point of the whole book of Galatians, this is the very thing Paul is rebuking. There is nothing really wrong with the meaning that the author is trying to convey per se, except for the fact that he isn’t getting it out of Galatians. As with prior lessons the author is inserting his own paradigm of law and gospel and interacting with that rather than framing it from the false gospel that Paul is rebuking. Paul is rebuking a false law that is being used as a false gospel. Not a true law that is being used incorrectly. There is a of course practical application in our day and age of not being a legalist, I’m just saying that’s not what is being taught here in this text. I am glad that the author chooses to leave the reader with a good understanding of what the reformers called the “second use of the law”. Which is of course, to point out sin in the heart of the unbeliever so that their mouths are stopped and they are prepared to hear the gospel. I am well aware of what SDA theology traditionally does from there, and how they add extra caveats to make your salvation contingent upon yourself. Particularly in the end times. But the author didn’t go there today and this at least is a good thing. Copyright 2017 BibleStudiesForAdventists.com. All rights reserved. Revised July 28, 2017. This website is published by Life Assurance Ministries, Camp Verde, Arizona, USA, the publisher of Proclamation! Magazine. Contact email: BibleStudiesForAdventists@gmail.com.